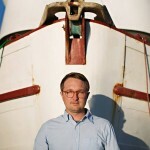 Seattle based musician Chris Staples is often times more well known for the artists he frequently supports as a guitarist than for his own outstanding solo material. Today I want to put the spotlight on Chris and share with you his beauty of a new single called “Hold Onto Something”. You can expect a mellow tune that may take some time to get under your skin and find a home, but once it does, you will find it’s not going anywhere. Chris easily has one of my favorite voices in the business. Pick up new album, American Soft, on August 12th via Barsuk Records.